Travel to a mountainous region of China where the Legend of the 5 Ninjas dojo hosts some thrilling action. The ninja clan consists of five warriors, Ka, Sui, Ku, Chi and Fu who work together to learn the secrets of the ‘Scroll of Knowledge’ before they can summon the ultimate ninja; Godai. Powered by Eyecon, this 5-reel new online slot offers 243 ways to win throughout the base game. Not only that, but there’s a fantastic Free Games Feature that can be triggered, which comes with a choice of free games and multiplier selections. Team up with the five warriors today to discover the Legend of the 5 Ninjas. Greeted by soothing traditional Chinese music, the Legend of the 5 Ninjas gameboard is set on the backdrop of an animated forest. The whistling wind and burning embers set the scene for some fast-paced action. The Legend of the 5 Ninjas base game consists of a variety of symbols, all of which have different values. The symbols with the lowest value are the arrows, numbchucks, machete and daggers. As for the medium paying symbols, you’ll have to discover the bomb and the five ninja warriors; Ka, Sui, Ku, Chi and Fu. Contributing to all your winning combinations are the Scroll WILDS. If you re-trigger this feature, you’ll be given the choice again as to which option you would like. This feature can be re-triggered up to 15 times. Check out more casino promotions and features bonuses on Slots Baby! Legend of the 5 Ninjas is one of the most relaxing and engaging games that Eyecon have developed. Their attention to detail with the animated characters gives this game a sense of purpose and an engaging storyline. 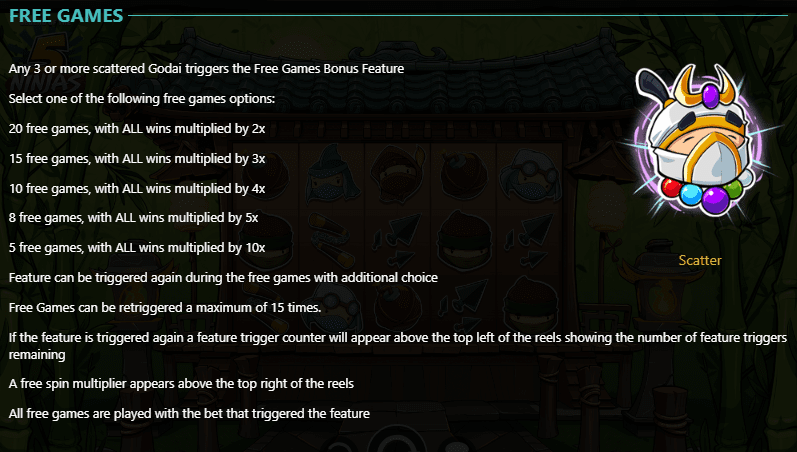 As for the gameplay, the base game has a lot of potential, but the Free Games Feature is where you’ll win big. 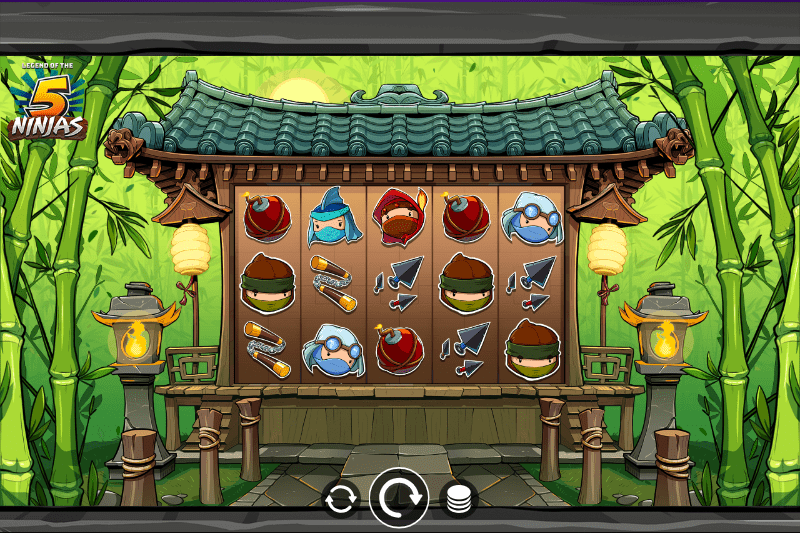 If you’re a fan of ninja-themed slots, it doesn’t get much better than Legend of the 5 Ninjas. If you enjoyed Legend of the 5 Ninjas why not try more games like it on Sbaby.